RV Tire Safety: Why should I weigh my Trailer tires individually? Why should I weigh my Trailer tires individually? Many times when I give a seminar or class to people from the RV community on proper application of tires, I get asked the above question by trailer owners. 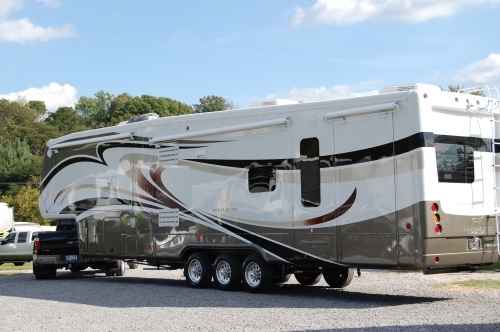 Motorhome users seem to understand that knowing the actual load on each corner of their RV will allow them to select the tire pressure they want to run as they balance Ride, Tire Durability, Fuel Economy and Steering Response. Owners of trailers say they have been told that all they need to do is to run the max inflation on the sidewall of their tires. Almost all the time, that is the information on their placard per the trailer manufacturer’s guideline so that recommendation seems reasonable. Recently I have been having a discussion via email with an owner of a large 5th wheel trailer. He even believes that because the load changes on every trip and almost every day it could be “dangerous” to get the trailer weighed as that could mislead the trailer owner to think it OK to lower the pressure to just match the minimum needed to carry the measured load. I would like to offer a different view on why it is important to get the trailer weights on each tire at least once. More than half of the trailers that have been weighed over the years have been found to have a tire or other suspension component exceeding its maximum load capacity. We all know what happens to people who “Assume” something. When you get the trailer weighed, it does need to be with all the stuff you normally carry on your travels. Knowing this load you will have the facts to see how critical it is to re-distribute the load side to side or front to rear. You will also know if your unbalance has overloaded one or more tires even when the total load seems OK. You will also know if you have proper loading on your pin. I have heard that some axle manufacturers consider having one end of an axle loaded to more than 50% of the total axle rating as overloading the axle. This means that even if you have changed wheels & tires to not overload those components you might still be overloading the axle if you are not careful. Another thing to consider is the “Reserve Load”. That is the “safety factor” between the actual load and the calculated maximum for a component. Most cars have a 12 to 18% reserve load. One of the other benefits of having a good sized Reserve Load is that it will allow you to occasionally bring home that big load of stuff you just had to buy at the flea market and not overload a component. One way to identify a minimum cushion would be to look at the load capacity of your tires when inflated to a pressure of at least 15 psi below the max inflation and to be sure your load does not exceed that level. A 20 psi cushion would be even better. Reserve load helps compensate for the unbalance that occurs due to side loading because of road crown and wind side loading. 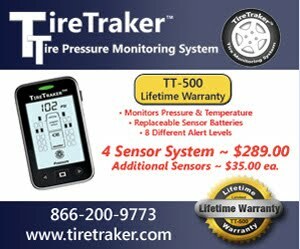 You are probably asking yourself why trailers can’t lower their tire pressure the way motorized units can. The reason has to do with the mechanics of axle spacing and tire side loading whenever you turn a corner. Trailers with two or three axles put enormous side loading on the tires, wheels, and axles whenever they turn corners. A quick look at the tire distortion when you see a big twin axle trailer park will confirm that the tire needs to be as stiff as possible when side loaded. Since we all know it is the air that carries the load we also now realize that it is the air that stiffens the tire and as a result will lower the side deflection and loading. BOTTOM LINE: Next time you are fully loaded please go to the effort of weighing your trailer and go the extra mile to do the multiple weighing and the math needed to calculate the actual load on the individual tires. Remember a blown trailer tire can lead to substantial damage and financial loss.